Acting behind enemy lines, you and your cohorts have liberated the stronghold of Drezen and the legendary Banner of Valour. The time has come to seek out the heart of the Worldwound and strike a mortal blow against the Templars of the Ivory Labyrinth. The Pathfinder Adventure Card Game: Demon's Heresy Adventure Deck is a 110-card expansion that adds new location, monsters, armies, villains, and more to the Pathfinder Adventure Card Game. This deck also includes rare loot cards and 5 new scenarios that make up the complete Demon's Heresy adventure. Continue your character's mythic ascension with the Pathfinder Adventure Card Game: Demon's Heresy Adventure Deck. 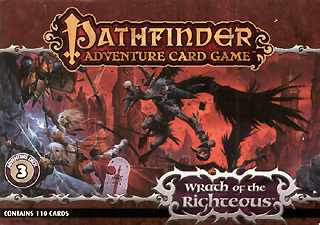 This deck requires the Pathfinder Adventure Card Game: Wrath of the Righteous Base Set and The Worldwound incursion Adventure Deck and the Sword of Valour Adventure Deck.